Young children are learning math every day. They count fingers and toes and by rote to numbers that are older than mommy. They compare quantities large and small and negotiate for more. They measure, add, and subtract. Children are learning more than math facts. They are actually constructing a way of understanding the world using numbers. Parents can help children develop a mathematical sense by simply tuning in to ordinary experiences of number and quantity. Young children understand a sequence of events before they can understand time frames. Nonetheless, parents can begin time awareness with the simple notion that there are numbers on the clock and one number is the time to wake up. Reading numbers on a clock is one way to show children all the places they can find numbers in the world. Teachers love to talk about one-to-one correspondence. Piaget discovered that children do not automatically understand number identity, i.e. “5” is always “5”. Parents play on this notion all the time when you break 1 cookie into 5 pieces and reassure your child that 5 pieces is a lot of cookie! Getting dressed is a great time to notice when numbers match: 2 arms for 2 sleeves and 6 buttons for 6 button holes – oops, what happens when you have a button with no hole? You might think you’re stating the obvious but young children are truly building foundational math concepts. Meals are amazing opportunities for math. How much? How many? From setting the table to measuring foods, children are engaged in seeing and evaluating quantities. Talk about the number of ingredients in a recipe. The brain is involved in abstract thinking when it comprehends four different ingredients (milk, eggs, batter, and bananas) mix together to make pancakes. It’s the same – It’s different – It’s called conservation of matter! Children can match socks. They learn about shapes while folding towels. They guesstimate how many cups of water fill the dog bowl. Do the numbers on your mailbox match the address on your mail? Deep thinkers and problem solvers need to be attentive observers. Whatever you’re doing, there’s probably a number concept lurking near by. Now you can take those observations on the road. How many red cars will you pass today? Keep adding to the number as you add stops to your day. Do the addresses on your street get larger or smaller as you drive in different directions? Where are the prices marked on items at the store? Is the store farther away or closer than grandma’s house? And can you make a picture map of all the places you like to go in your neighborhood? Math is fun to young children. Parents can use math to relieve the stress of transition times. Can you take 20 giant steps to get to the bathtub? Play counting games while you’re waiting in long lines – let’s blink our eyes 11 times and roll our hands 6 times�now faster�now slower. Stopwatches even make clean-up a game – I bet you can’t pick up all the blocks in 4 minutes�I’ll time you�ready, set, go! Ordinary directions can become a challenge – I need something from the table in the living room�It’s a square, smaller than a watermelon and bigger than an apple. Even love is quantifiable – How much do I love you? Not a pinch, not a bushel, I love you more than all the stars in the sky. Then in your spare time, add board games to your family routines. Marian Diamond and Janet Hopson in the book Magic Trees of the Mind (page 180) say, “As simple as it seems, the presence of board games in a child’s home is a good predictor of math competence in school”. 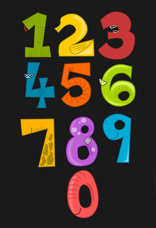 So get out that Chutes & Ladders and your child will really master number-line thinking. Thinking in numbers may be easier than you think. Try it for one week. It may add some serious fun to your child’s day.